Find hotel near Complexo Ambiental Cyro G .. The Complexo Ambiental Cyro Gevaerd Zoologico is a popular family spot with a high standard of care shown for its friendly animals. 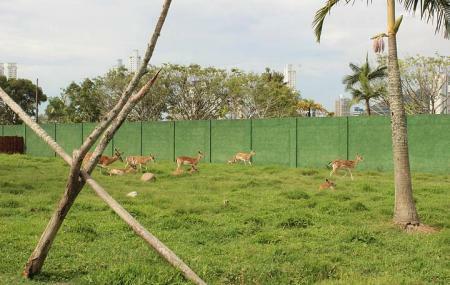 The Zoo is home to Mammals, Birds, Reptile and Fishes and also has a Mini-Farm with cattle’s, horses and poultry. If you are travelling with children or simply love animals, the Zoo is a good choice to spend an afternoon at. Love this? Explore the entire list of places to visit in Balneario Camboriu before you plan your trip. Fancy a good night's sleep after a tiring day? Check out where to stay in Balneario Camboriu and book an accommodation of your choice. How popular is Complexo Ambiental Cyro Gevaerd Zoologico? People normally club together Parque Unipraias Camboriu and Igreja De Santa Ines while planning their visit to Complexo Ambiental Cyro Gevaerd Zoologico.